Writer/director Matt Spicer and his feature directorial debut, Ingrid Goes West, nail it. For a long time. For most of the runtime, actually, Spicer and his film nail exactly what he and it are going for. In every detail the script supplies or that drips from Aubrey Plaza's inherently mocking facade into what the actress applies to the titular character Ingrid Goes West is as sharp as it needs to be in order to achieve this kind of sardonic satire it's going for in each of every one of those aforementioned details. That Spicer and co-writer David Branson Smith are able to craft an interesting narrative from the seemingly simple idea of exposing those who live their lives striving to create the appearance of another kind of life on social media is encouraging first and foremost, but that through this they are able to utilize that premise to support and point out all the obvious and sometimes dangerous/creepy aspects most might not consider when posting to Instagram makes the mockery that much funnier due to the fact it's so true. As with many an inspired tales, Ingrid Goes West begins strong by highlighting some of these little truths to what is not necessarily an exaggerated effect, but maybe more frightening is that depictions of Plaza's Ingrid trying to figure out the best phrasing for an Instagram comment are so accurate they need not be exaggerated, but more just held up in front of us in order to realize how trivial and silly it all really seems. Ingrid Goes West understands this semblance of effortless cool is indeed serious business to some though and with that it doesn't so much talk down to the intended audience it desires to simultaneously mock and enlighten, but rather Spicer and Smith's screenplay comes around to the inevitable (yet encouraging) conclusion that to be your own cool is the coolest cool there is. This is exemplified through a particularly hilarious and exceptionally performed character named Dan Pinto (O'Shea Jackson Jr.) who comes into Ingrid's life at a crucial time and provides the kind of real, tangible, human interaction her life and being so badly craves-even if Ingrid herself doesn't realize this for much of the film. That it takes Ingrid so long to understand the simple epiphany the film eventually has would be rather testing did the majority of the movie not land so precisely on how exhausting it can be to keep up these kinds of fronts that feel obvious in their fraudulence, but are so convincing in their execution they may as well explicitly state that one should feel inferior. 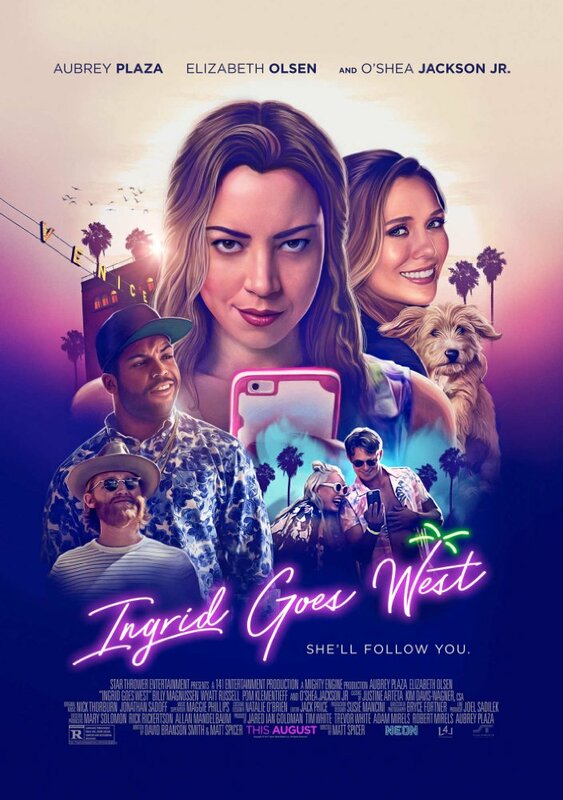 That Ingrid Goes West ultimately lands on the non-revelation it does gives this hard and fast social commentary an otherwise disappointing last act. Ingrid (Aubrey Plaza) catches up on some light reading after seeing a famous Instagrammer quote Joan Didion on her page. Upon meeting Plaza's Ingrid she has mascara streaming down her face, sports what seems to have been a bridesmaid's dress of some sort underneath a blanketing sweatshirt, and is very clearly upset by whatever she is looking at on her phone. What might she then be looking at on her phone you might ask? Well, that would be Charlotte Buckwald who is a character we don't know and will never get to know, but given the events that follow can surmise is a well-to-do female who publishes her daily (and no doubt multiple times a day) accomplishments on social media in artistically framed and beautifully filtered shots that would convey a sense of perfection to anyone scrolling through the latest posts of those they've chosen to follow. While the remainder of Ingrid's get-up would suggest she was supposed to be in a wedding the fact she is scrolling through all of Charlotte's most recent posts of her wedding day coupled with the fact Ingrid isn't present in any of them indicates there is turmoil to the situation. What we aren't aware of until Ingrid storms into the reception and sprays the bride with pepper spray before publicly denouncing her for not inviting her to the wedding is that Charlotte and Ingrid weren't friends at all. Their friendship didn't fall apart just before Charlotte's big day. Ingrid didn't do anything to make Charlotte mad enough to kick her out of her wedding and thus any memory the pictures from that day would provide for the rest of their lives, but rather none of this is in regards to a relationship that actually existed between Charlotte and Ingrid. In all actuality the confrontation occurs because a total lack thereof. Ingrid is carted off to a mental institution where the circumstances of her and Charlotte's relationship become a little more fleshed out-Ingrid essentially being a stalker of sorts to Charlotte on both Instagram and in real life after Charlotte apparently did little more than "like" one of the comments Ingrid left on one of her photos. It's clear then that Ingrid is not well and yet she is swiftly released from the hospital with no seeming progress having been made. Add to this the recent death of her mother and it must seem like some kind of divine intervention when Ingrid comes across a magazine article on social media influencer Taylor Sloane (Elizabeth Olsen). Ingrid instantly becomes fascinated with Taylor and everything she posts eventually working up the courage to write a comment on one of Taylor's posts to which she later receives a response from Taylor herself. Naturally, this then prompts Ingrid to take her inheritance money left to her by her mother (which totals about $65,000) and move to southern California. Of course, while this idea of Plaza's Ingrid Thorburn as a representation of some of the darker, more extreme roads one might go down when taking social media to be a factual representation of people's lives is what supports the plot of Ingrid Goes West the movie is really about exploring the conflicts of both the good and bad that can come from social media. There is much to glean from Facebook and Instagram in regards to connecting the world through shared feelings and experiences despite the fact we might be thousands of miles apart or allowing families who deal in long distances to feel more a part of one another's lives through the pictures that are shared and status' that are updated, but in allowing such connectivity a trend of people creating an online persona as opposed to who they are in real life has developed and with it this need to strive for "likes" from people you may not even necessarily like yourself; still, the approval is gratifying in a way and anyone who has ever felt self-conscious at all can relate to these feelings of inadequacy and thus the feelings of legitimization when acknowledged by others in positive ways. It's not difficult to empathize with Ingrid as most have likely experienced some degree of what she displays, but it is in the recognizing of the difference between what Ingrid so desperately wants in her life and what she actually needs that separates the obsessed from the well-rounded. This kind of internal conflict takes us back to the basic screenwriting techniques of want versus need where the protagonist wants something, which is, in this case, to fit in with those she aspires to be like, for which she then strives for, but typically near the end of the second act discovers that what she wants doesn’t really match up with what she truly needs. In a film that follows these standard rules of character arcs and motivations Ingrid would have ditched her original motivation for this newly realized need and marched into the third act with a new purpose. Of course, films don't always have to adhere to such stringent guidelines and Ingrid Goes West makes its bigger point by displaying that Ingrid is too sick, too preoccupied to take a step back and realize that her want will never truly satisfy the need that is leaving a big hole in her life. Spicer and Smith certainly want to zero in on this eccentricity as the film gets further and further along and the satire becomes less striking than the welfare of their main character, but while it feels natural for Ingrid to take this kind of approach where she is aware of what drives her and turns to that drive as a kind of source of motivation to get her to where she wants to be, they don't ultimately give her a strong enough dose of reality to wake her up from what are in fact delusional motivations. Maybe that's the point, but it certainly didn't feel as effective or as dark as the comedy hinted the picture would be in the beginning. Ingrid moves to southern California to meet and make friends with hip interior designer Taylor Sloan (Elizabeth Olsen). Where Ingrid Goes West excels most is in the irony it so hilariously flaunts as well as in the performances across the board. From sending up L.A. hipster start-ups that offer waiters who come to your table and greet you with, "My name's Eden, how can I nourish you today?" to that of shopping at the farmer's market for the sake of saying you shop at the farmer's market or simply posting pictures of books you've never read while using a single quote taken out of context to use as the caption-everything that documents about how Instagram is used is brutally honest and therefore hilarious because it perfectly encapsulates everything there is to love and hate about online facades. While Ingrid is the (anti? )hero of the movie she is not the one that Spicer and Smith pin all their complaints about Instagram on, but rather they spread the love between her and Olsen's Taylor who, while Plaza exudes the perfect glances of a psycho stalker, couldn't have personified a better version of what most of us would imagine when pitching such a character. Taylor, like the previously described Charlotte, is the type of girl who will take pictures at the salon and talk about getting her hair done while the picture itself will be of her and her hair in pristine condition. Taylor is the type who labels everything as, "the best!' even when it's definitely not the best. Taylor is the type that will ask a random person to get down on the ground to take a picture just so the angle and aesthetic will carry a more creative vibe and it's all funny because it's spot-on, but again-it also clearly communicates how exhausting it all is. Undermining these ludicrous goals of perfection that Ingrid is chasing is Plaza's performance as she is totally game to eat kale with Taylor and her artist husband, Ezra O'Keefe (Wyatt Russell), at the hipster joint, but will then drive through McDonald's for a burger and fries which is what we all really want and actually enjoy no matter how humiliating that might be to admit. Furthermore, the supporting players are just as great and integral to the kind of environments that sustain each of Taylor and Ingrid's distinct auras. The aforementioned Russell is almost a parody of himself in that he wants to be off the grid and not document his every move, but upon seeing his "art" it's very clear the guy might be as delusional about his talents as Ingrid is about her status. The scene-stealers though are Jackson Jr. and Billy Magnussen as Taylor's brother Nicky. Jackson Jr.'s Pinto is an aspiring screenwriter obsessed with Batman and more specifically, Batman Forever, which he relates everything back to while not being afraid to embrace his own quirks which make him appealing to those he comes in contact with. Dan is the definition of balance in this film while Nicky immediately sees through Ingrid's fake persona and calls her on it as well as the extent of her manipulation tactics. It is through these layers of personalities that Ingrid Goes West finds the strength to be a mostly compelling dramedy on top of its social satire elements, but neither of these are strong enough on their own terms to merit the film as a wholly smart and introspective look at modern dynamics even if it feels like as much for the longest time.